WOW Training Aids created and designed by boating instructors, for boating safety education instructors and boating skills instructors. Featuring a wide variety of full-color, attractive computer graphics. WOW Training Aids are laminated for durability, pre-cut, fully assembled, and with magnets already applied; they come ready-to-use out of the box. Boating safety education instructors and boating skills instructors can easily create and animate scenarios or quickly change scenarios. Use on a magnetic board, tabletop, or elsewhere. 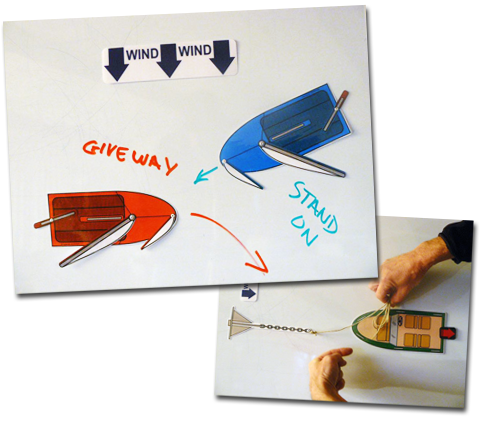 Use to conduct interactive student learning activities in the boating education classroom. WOW Training Aids are available in pre-packaged sets or as individual pieces.